Perfect for positioning, balance, postural and muscle re-education, spinal stabilization, body awareness and coordination, and ranging and strengthening activities. Round rollers offer progressive exercise sequences - user can move from an easier (smaller diameter) to a more difficult (larger diameter) roller. Half round roller is a great tool for ankle stretching and knee rehabilitation. 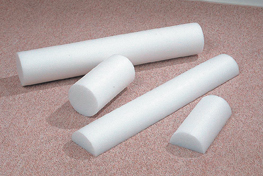 Foam rollers can be used alone or with other exercisers such as exercise band, tubing, weights and balls.